Singer, songwriter, humanitarian, film producer, avid gardener, George Harrison was a man of many talents and interests. Initially gaining worldwide fame in the 1960s as a member of the Beatles, he went on to an accomplished solo career that spanned three decades. Remembering George, the Multimedia Presentation, provides highlights from Harrison’s life and career and features many tributes to him sent in by fans. In the essay, writer John Uhl takes a look at the continued mania the Beatles generate more than 30 years after their breakup. The catalogue of songs from the concert and links to video excerpts of three numbers are included in the song list. 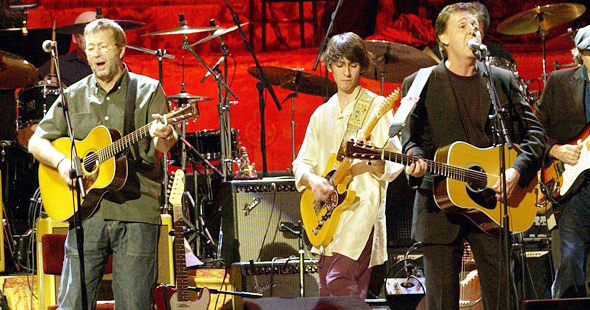 CONCERT FOR GEORGE premiered on March 3, 2004.